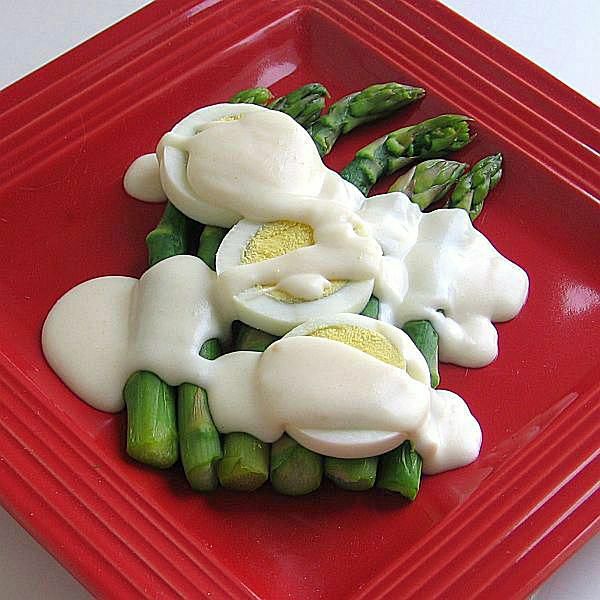 This recipe for asparagus and hard-cooked eggs gets the royal treatment with a creamy white sauce or béchamel. Hard-cooked eggs are very popular in Hungary, Lithuania, Poland, Russia, Ukraine, and other Eastern European countries. In the old days, it was a relatively economical source of protein for farmers who usually raised chickens. Hard-cooked eggs over toasted bread smothered with white sauce, also known as béchamel is always a treat. We have this craving often, but we've updated it by adding asparagus and serving it as-is or over toasted whole-grain bread or buttery brioche for extra decadence. It is a filling meatless meal for Lent and vegetarians, but don't count it out as a fancy luncheon dish when fleshed out with salad and petit fours for dessert. Cook 1 pound asparagus spears in salted water until tender but not mushy. Drain and keep warm. Meanwhile, make the cream sauce by 3 tablespoons melting butter in a small saucepan or skillet. Add 3 tablespoons all-purpose flour, stirring and cooking for about 1 minute. Add 1 1/2 cups milk and whisk until smooth. Cook, stirring constantly until mixture thickens and comes just under the boil. Season with salt, if desired. To serve, if using toasted bread, place 1 slice on each of 4 plates. Arrange 1/4 of the asparagus spears on top, followed by 1 sliced hard-cooked egg. Then ladle sauce across the top. Pass the rest of the sauce at the table. Note: To turn the béchamel sauce into a Mornay sauce (cheese sauce), add 2 ounces grated Gruyère cheese, 2 ounces grated Parmesan cheese and 1 tablespoon butter to the simmering béchamel sauce. If necessary, thin with up to 1/4 cup hot whole milk. Do not let the sauce boil or the cheese will become stringy and break down. If you want to go full tilt, substitute heavy cream or half-and-half for the milk in the white sauce recipe.